The RISCA offices are located on the third floor the Powers Administration Building at the Capitol Hill Complex (see picture below). The address for the complex is One Capitol Hill, Providence, RI 02908. If arriving for a meeting or appointment, please allot yourself at least 10 minutes to find parking and walk to our office. Access Route I-95 headed North into Providence from I-95 South or I-195 West or East. Take exit 23, “Rt. 146/Woonsocket/State Offices”, bearing right. At the end of the exit, go straight ahead through the stoplight, crossing Orms Street. Take your next right into the parking lot. RISCA’s offices are on the third floor of the Powers Administration Building (see photo). Take exit 23 “Charles Street”. At the end of the exit, you must bear right, and then get into the left lane to take the next hairpin left. Follow this road to the second light. Take a right turn onto Orms Street, and a left at the next light (before crossing over I-95). The first right will take you into the parking lot. 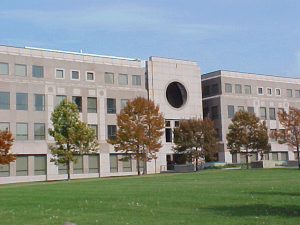 RISCA’s offices are on the third floor of the Powers Administration Building (see photo). From Rt. 146, take the Admiral Street exit. At the end of the ramp, turn left at the stoplight onto Admiral Street. At the next stoplight, bear right onto Charles Street, and then follow the road past the Post Office a liquor store on your left, bearing right as it runs into Ashburton, a one-way street. Continue to second set of lights. Turn right onto Orms Street. At next set of lights (before crossing over I-95) turn left onto State Street. Immediately turn right into parking lots for State offices. One Capitol Hill is large pink marble building closest to I-95. The lots immediately surrounding the Powers Administration Building are gated. However, sometimes the gates are left up. If this is the case, feel free to park in these lots if you can find a spot. Otherwise, there is metered parking on Park Street, Smith Street, and State Street. There is also relatively inexpensive parking in the Providence Place garage, which is a 5-10 minute walk from our offices. The north garage is closer, and often has more available spots. There is also free parking in the surrounding neighborhoods, if you are willing to walk a bit. All parking for people with disabilities is in the garage under the building. The entrance ramp goes from the parking lot towards the building. Take a ticket to open the gate, and follow the signs to the handicapped parking near the garage elevators. Take the elevator to the Ground or first floor, and then transfer to the building elevator to reach other floors. Sign in at the reception desk on the first floor, then take the elevator to the third floor. Turn right out of the elevators, and follow the signs to our offices.